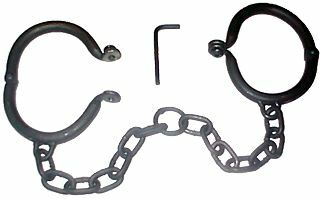 Simple leg irons, constructed identically to PXDirect Handcuffs These irons lock when a hex-screw is applied to hold the two halves together. The irons themselves are made from 3/8" round stock with a welded rivit acting as the pivot hinge. Connecting the two irons is a 12" chain with a ring in the middle (allowing the passage of a chain through multiple pairs of leg irons to form a gang chain. The sizing is for use with boots. To stay on a bare ankle, it would be necessary to order a custom size, smaller than the smallest catalog size of M.